Congratulations on your upcoming union! Danville Congregational Church is pleased to share in this happy occasion. 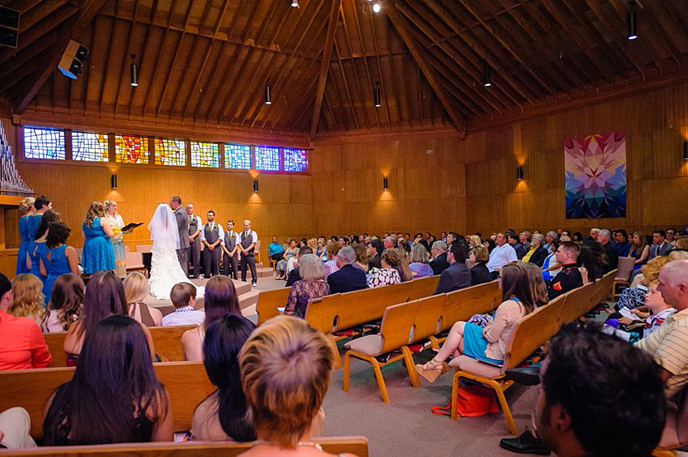 A church union differs from a civil ceremony in that it is a service of worship. Christian union is a joyous occasion in which you will say sacred vows and make a covenant with one another, and with God, in the presence of loved ones. A minister who presides acts as an official representative of the church and gives the union the church’s blessing. If you would like to have another minister perform your union, notify the event coordinator and we will arrange a meeting with the minister, yourself, one of our pastors, and one of our hostesses. Contact the church Event Coordinator, events@danvillechurch.org, to determine availability and provisionally reserve available ceremony and rehearsal dates and to schedule an appointment with our Event Coordinator. We will confirm your ceremony date once the deposit is received. We will send written confirmation of ceremony and rehearsal dates, name and phone number of your Event Coordinator (who will be your church contact and can answer questions regarding flowers, decorations and other details). On the application form, you are asked to specify a 3-hour time block for your event (beginning 90 minutes before the ceremony). In most cases the ceremony itself will last 20-30 minutes; the rest of the time is ample for flower delivery, dressing and photographs. Please discuss your need with your Event Coordinator. The rehearsal usually takes place a day or two before the ceremony. All members of the party and the parents of the couple should be present. Please remind everyone to be punctual! If you have a marriage license, please bring it to the rehearsal to give to the minister. The rehearsal time is included in the price and typically lasts 2 hours. Music is one of the beautiful memories of a wedding ceremony. Please discuss your ideas with your Event Coordinator. A Music Director at Danville Congregational Church may be available and have ideas for your ceremony. Please consult with your Event Coordinator before finalizing plans with a florist. Carried candles or pew candles are not permitted. A ceremonial candle placed on the altar is welcomed. If you wish to leave the main flower arrangement with the church, please inform your Event Coordinator so that we may acknowledge your kindness during worship. Picture-taking must be concluded at least 20 minutes before the scheduled start of the ceremony. To preserve the sacred nature of the ceremony, we have the following guidelines. Processional March: Photographs may be taken. During Ceremony: NO FLASH PHOTOGRAPHS. Photographs may be taken with available light. Recessional March: Photographs may be taken from behind last pew. Videotaping, using a stationary tripod, from behind the last pew. Videotaping behind the chancel (facing the bridal party) may be done, using a stationary tripod without an attendant. The minister will request that guests refrain from taking pictures or videos during the worship service. Photographs may be taken in the sanctuary following the ceremony. Please assign someone to remove personal belongings from the church after the ceremony. Please keep your Event Coordinator informed of changes in details as your plans progress. If you would like to have your reception in one of our two social halls, please ask the Event Coordinator about availability, additional cost and other details. Wedding fees include the use of the sanctuary and church grounds for three hours and a rehearsal. A sound technician is included for the rehearsal and ceremony. Your non-refundable reservation fee of $500 will confirm your ceremony and rehearsal dates. The balance is due one month prior to your ceremony date. CLICK HERE for a downloadable version of this information.